The 2019 Pantone color of the year is brilliant and full of energy. It’s easy to use too much of it and let it monopolize a room or you might not use enough, allowing it to be hardly noticed. Here are some of the best examples of Living Coral we’ve found to inspire you on your endeavor to keep up with decorating trends this year. By painting one wall coral and keeping the other walls and the furniture a light neutral gray, the room isn’t overwhelmed by vivid colors. Adding the coral throw pillow to the sofa and using all gold metal pieces keeps the room cohesive and modern. 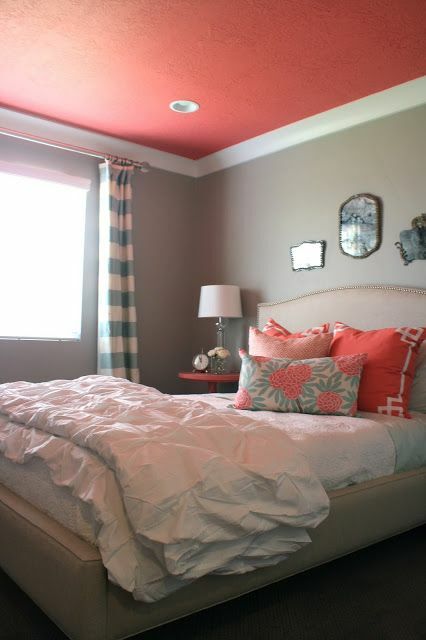 You don’t need to go all out to incorporate Living Coral in a room. A quick fix can be using a few accent pillows in a room full of neutrals, like beige and gray. Adding a couple of small decor items in coral can also bring more life and vibrancy to the space, like vases and decorative containers. An energetic blue, as opposed to neutrals, paired with coral, gives the room a younger, but not childish, feel. 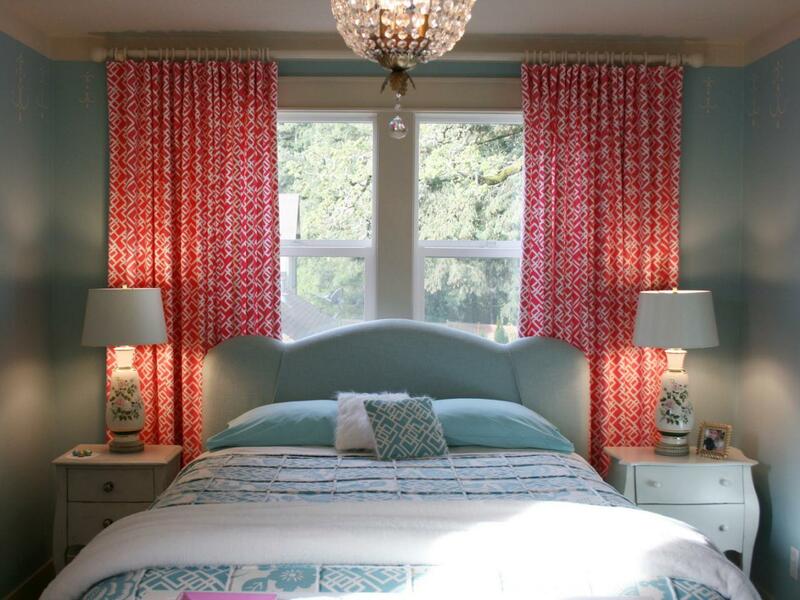 The patterns in both coral and blue create a lively overall atmosphere, even in a small space. It’s hard to go wrong with monochrome. Instead of making Living Coral an accent that brings a pop of color, using it as the central color and theme conveys a simple, classy ambiance. Black is the accent in this case and it contrasts well with the rest of the space and adds depth. Off-white creates a stark, yet tasteful canvas. 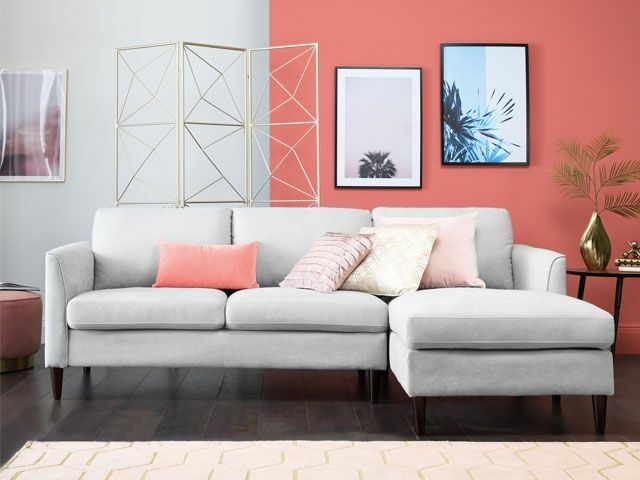 The patterned pastel blue pillows already have modest streaks of coral, paving the way to naturally incorporate a larger piece of furniture in the shade of Living Coral. The ottoman itself is simple and its detail doesn’t detract from the rest of the elements in the room, making it a perfect fit. Another example of light blue and off-white, no single element commands the attention of the room. The coffee table’s bright coral color is slightly subdued by the smaller pieces of decor on top of it, so it doesn’t dominate, but rather compliments the room as a whole. 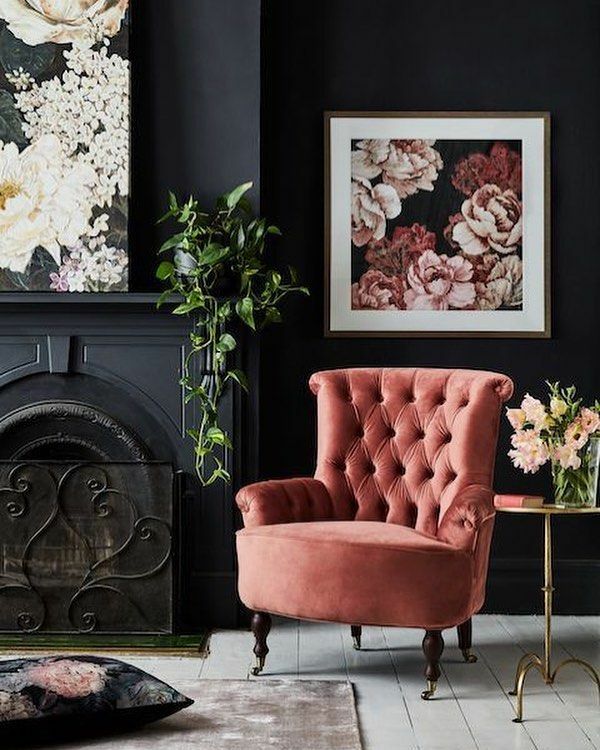 Deciding on black can be a bold move because it can make a room feel small and confined. As Living Coral is an intense, upbeat tone, it perfectly contradicts the dark walls and establishes a balance. Turning the ceiling into the accented wall draws your attention upward yet doesn’t overpower other colors and components in the room. 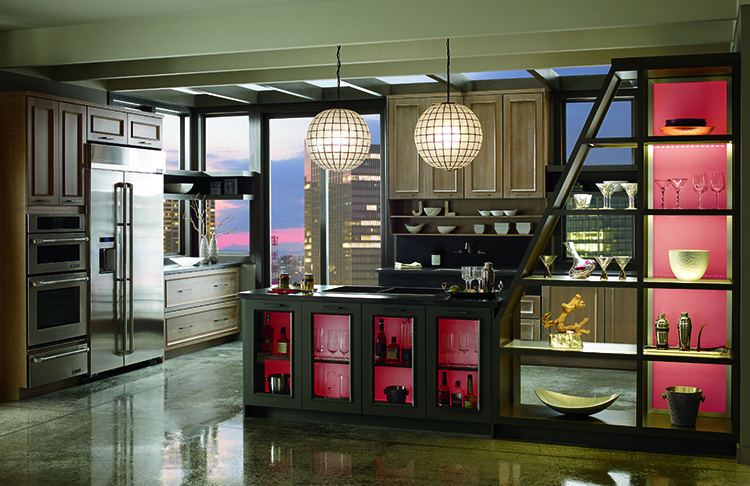 Choosing darker neutrals tones the room down, and adding cabinets with visible Living Coral interior is a unique way of livening up a shadowy monochrome theme. It keeps the room chic and modern without feeling boring. 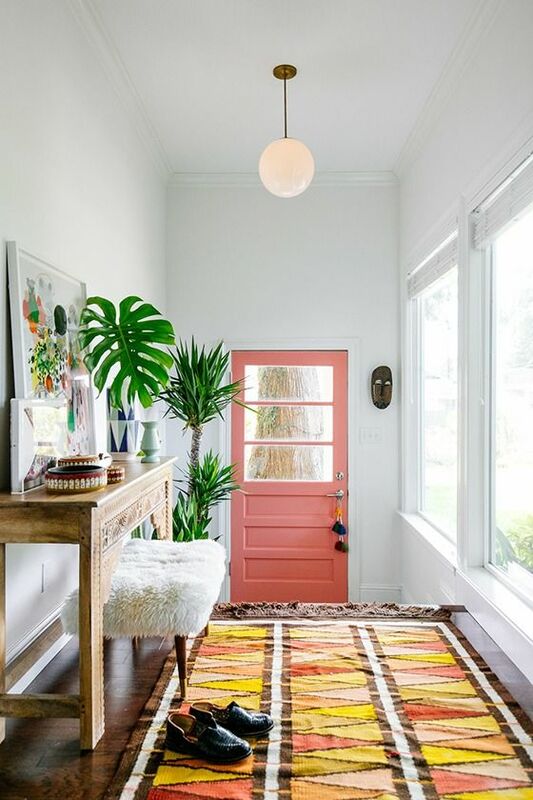 A simple door is the focal point of this entryway, but it’s complemented by the deep green plants and the rug full of oranges and yellows to form a happy tropical vibe. Simple mismatched elements, like the posh white bench and the wooden mask on the wall, are a whimsical way to add extra character to a small space without detracting from the bright door.